John, Alvin, Levi and Jolin - the Amish Mafia. Every now and again, a show hits cable that is based on such a ridiculous premise that it boggles the brain to think it even exists. But it does exist. And it is good. That my friends is Amish Mafia on the Discovery Channel. 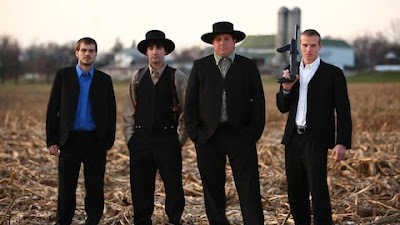 The show is a docudrama following Lebanon Levi and his crew of Amish enforcers in Lancaster county, PA. Levi is the Tony Soprano if you will of the group. He does the dirty work for the Church, protecting the Amish community, whether it is from rogue English people damaging buggies or my favorite, English people pretending to be Amish and sell fake Amish goods. Levi's right hand man is Alvin, who loves to whack stuff with a baseball bat and then torch it while quoting scripture. John is the dumber than a box of rocks new guy in the crew. He can be seen on his sisters scooter speeding down the street to his next meeting at the barn. John is always trying to get ahead and fails miserably at every turn. My opinion is he would be the first to get whacked. Jolin is the Mennonite member of the crew, allowing him to do things that the Amish guys in his group can't such as drive and be tatted up to the extreme. If he were in Goodfellas, he would be like Henry. Never able to be a full member of the crew. The other main character is John's sister Esther, who is an Amish Snooki. She gives the viewer an insight into Amish life and occasionally lets her hair down. Look out party people! With those descriptions, how could you not watch? Various members of the Amish community, faces blurred, show up to Levi's barn office and in the midst of horses and hay, they ask for his help. Maybe it is to report a woman hanging her undergarments out to dry in the open yard, a Church Bishop hanging out with a prostitute or in an explosive scene, a damaged buggy. The Amish pay Levi and his gang what amount to protection money, an Amish insurance policy. If there is a claim, Levi sends a foot soldier out to investigate and goes from there. In an early scene, Jolin investigates a woman who claimed that her buggy was damaged by an English (you and me) man when he tried to pass in his car. The woman starts speaking in Pennsylvania Dutch, which according to Esther is what Amish do if they don't want you to know what they are talking about, telling Jolin what happened. He shows up at the man's trailer, sees the damaged car and tries to confront him. 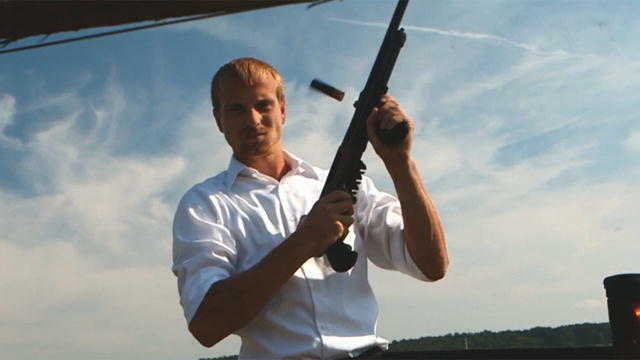 When the guy refuses to take responsibility, Jolin deals with the situation in the biblical sense...he takes his shot gun and blasts out the windshield. The season finale in on Wednesday night on Discovery, and I strongly encourage you to tune in. If you are watching for an in depth understanding of Amish culture and religion, you won't find it. If you want an amazing piece on entertainment, you are getting your money's worth for sure. I started watching that show, and I didn't care for it...maybe it got better as the season went on? I watched the other Discovery Amish shows and enjoyed those!